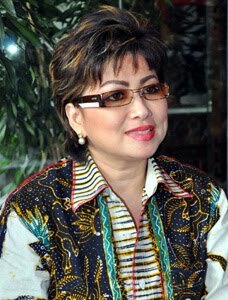 Former movie star and artist Maya Rumantir threatened fails to follow the election of the Governor of North Sulawesi. The reason, the Maya Romantir who replaced the previous candidate, Vonnie Anneke Panambunan considered late to register. "My successor earlier than that at the input to the Election Commission. I see any deviations. We should have given seven days to give time. However, if the initial example does not qualify, must be notified to the party that carries. But this is only to candidates Just notice, "said Maya Rumantir told reporters in the Red Café Delima, Kebayoran Baru, South Jakarta, Thursday (16 / 7) evening. Women who had reportedly close to Tommy Suharto was suspected there was a lot of cheating done by the organizers in this case the Election Commission. Especially before scheduled elections in North Sulawesi, it should be carried out in September. "If forced dated August 3, was legally flawed. That became a problem again, my file is already entered, even ignored. It's what's behind all this," said Maya.